Tis’ the season for barbecue! So much so that Texas Monthly gave it the coveted cover story for their June issue – “The 50 Best BBQ Joints in Texas in the World.” In it, Texas Monthly staff and barbecue editor Daniel Vaughn provide a map of Southern BBQ noting Memphis ‘que as “shredded swine” and Mississippi/Alabama/Florida barbecue as “God only knows.” They primarily stick to Texas. Below, we’ve got a map to help you find some of the best barbecue in the southeast based on the work of James Beard Award-winning author Robb Walsh and acclaimed documentary photographer O. Rufus Lovett. They do know the barbecue cultures beyond Texas borders and hit the trail on a mouthwatering epic road trip from East Texas to the Carolinas in the new book Barbecue Crossroads: Notes and Recipes from a Southern Odyssey. 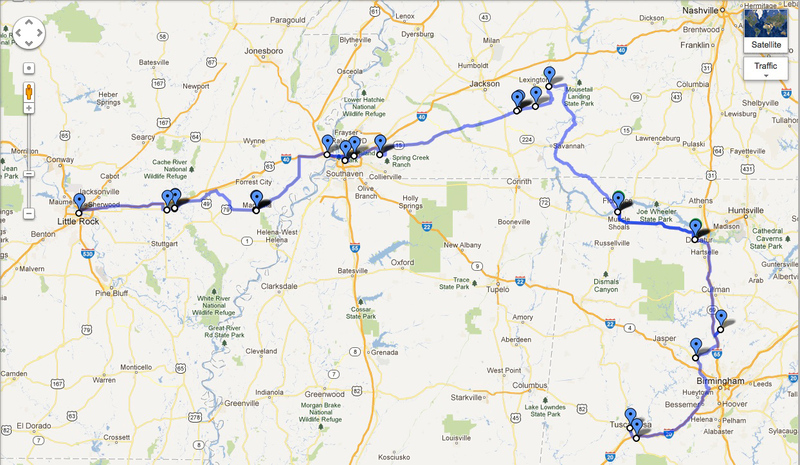 You can recreate their journey with the Google map below. And, don’t miss Texas Monthly’s first-ever statewide Texas Barbecue Week – July 15-19 and take advantage of deals from BBQ joints across the state! 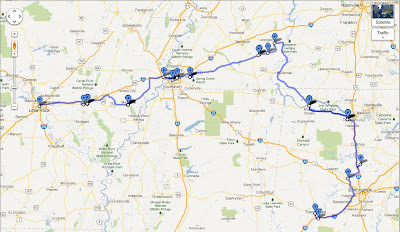 Disclaimer: The route linked below maps the odyssey Robb and Rufus traveled in the process of writing Barbecue Crossroads. To get the most out of this journey, we recommend buying and reading the book in full before embarking. Enjoy! North Carolina and Texas make a big deal about their old-fashioned barbecue pits, and those places get a lot of national attention. But the treasure trove of barbecue joints in Alabama came as a shock to me, and so did the variety of shapes and sizes they came in. As a native of Alabama, Rufus adopted a bemused, “I told you so” attitude about the state’s unsung barbecue glory. From the road, all you could see of Archibald’s Bar-B-Q was a cloud of smoke emanating from a chimney. As the Honda Element climbed the hill to get to the parking lot, we could make out the rivulets of creosote that traced black lines down the white monolith of the pit chimney. Some ran all the way to the ground. There were picnic tables outside, but the abundance of flies made the outdoor dining areas unusable. So on an early Saturday morning in August, Rufus and I sat at the counter of Archibald’s in Northport, Alabama, watching one of America’s foremost barbecue artisans at work. George Archibald, Jr., is the pitmaster and owner. He took the place over from his father, George Archibald, and his mother, Betty Archibald. For many years, George Sr. worked in a steel mill and Betty worked in a paper mill. In the mid- 1950s, the couple bought the barbecue business from James Morrows, who built the place. It was their dream to get out of the mills and own a business of their own. Their son, George Jr., started working at Archibald’s when he was twelve years old. When he and his sister Paulette took the place over, they started working opposite shifts, relieving each other over the course of the day. The pit at Archibald’s is different from the pits we had encountered in Tennessee. There, wood was burned down in a separate fireplace and coals were shoveled into an enclosure two feet or so below the meat; here, the wood fire burned directly under the grate, but at a greater distance from the meat. Every half hour or so, George went outside to throw a hickory log on the blaze. He opened the steel doors on the outside of the chimney and shoved the wood in, then closed it up. From the inside, he slid open the pit door to turn and check the meat. George Archibald, Jr.’s meat fork was five feet long. It looked like a regular barbecue fork that had been screwed onto the end of a mop handle. The long-handled fork made it easy to reach the meat in the back of the pit without leaning too far into the intense heat of the fire. Watching George work from a few feet away was an education. George Archibald usually cooks low and slow—but when he is in a hurry, as he was this Saturday morning, he stokes the fire up high and cooks ribs in an hour and a half. His Boston butts were started early that morning to be ready for lunch—a cooking time of a mere four or five hours. This technique reminded me of Central Texas meat markets like Smitty’s, where a shoulder clod gets cooked at temperatures over 400°F in little more than four or five hours. Later in the day, George would slow the fire down and let the meat coast on the coals until dinnertime. George Archibald, Jr., is a friendly man who is willing to discuss the Crimson Tide’s chances for a national championship or the tornado season, but don’t try to engage him in a conversation about barbecue. When asked what he thought of barbecue joints in Tuscaloosa, just across the Black Warrior River, he freely admitted that he had never been to any other barbecue restaurant. “I get tired of barbecue,” he said. After all, he has done little else since he was twelve. The stools that Rufus and I occupied for some three hours were directly in front of the steel door that opened onto the pit. We ate George’s succulent ribs while we watched him work and waited for the Boston butts to be done. Every time the steel door slid back, you could feel the heat on your face. When George stabbed a piece of pork, smoke blew into the tiny dining room, and you could hear the meat sizzle and smell the aroma of hot pork and burning hickory. It was among the most visceral barbecue-joint experiences I can remember. 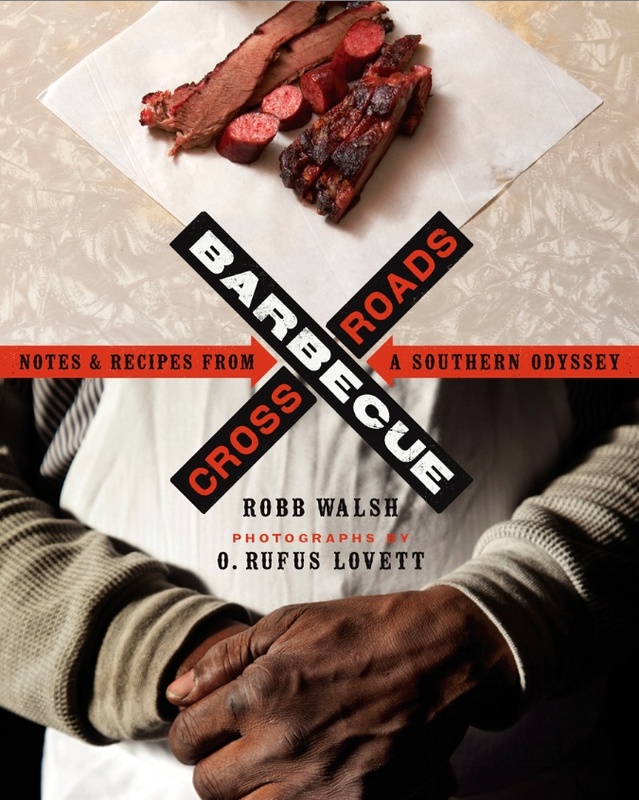 From Barbecue Crossroads: Notes and Recipes from a Southern Odyssey by Robb Walsh with photographs by O. Rufus Lovett (Copyright © 2013).